PuDong represents the newer and modern Shanghai. LuJiaZui is in the heart of PuDong and is the most well developed area of PuDong in Shanghai. Many 5-star hotels and luxury shopping malls like IFC are in the area. I spent quite sometime in the area during my Shanghai trip because Mr.SF and I are having our wedding there in Oct. You girls probably already saw our ceremony location here. The view is just breathtaking. I packed this pair of Valentino rock studs ballerinas with me for the trip. Dress up or dress casually, you just can't go wrong with this pair. 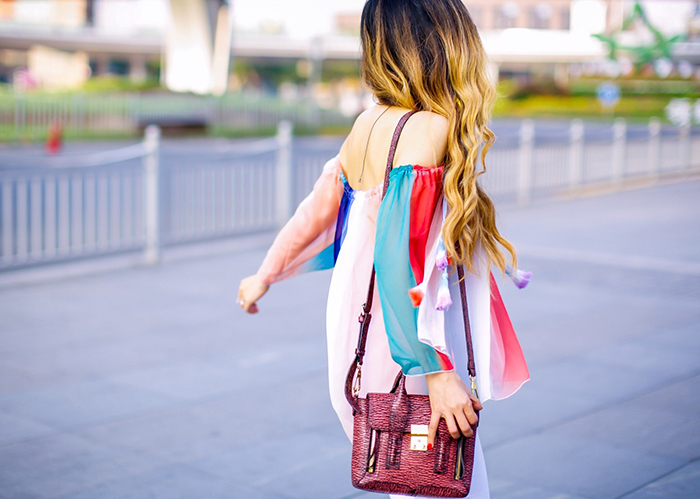 BTW, this romantic rainbow tassel top is on sale for only $11. Have an amazing Monday, babes! Such a fun top. SO cute!